My sabbatical from work starts in 1 week so I think it is time to start some preliminary hiking. Being a bit anxious, I am picking the only part of the Appalachian Trail I am familiar with: Hot Springs, the site of my hiking workshop last December. My goal is hiking from Max Patch, a well-known bald, to Hot Springs in North Carolina. Bald is an interesting word that I hadn’t heard before in reference to a mountain. Like a person who no longer has hair, a bald is a mountain that does not have trees at the top of it. This makes for some really beautiful and impressive views. I am hiking an easy 6.6 mile section by myself into Hot Springs. Then I will check into the hostel, have Mike join me for dinner and complete the more difficult 13.2 miles the next day. I check the weather forecast which is calling for 45 degrees and cloudy. No problem, right? I drive to where my GPS says there is a parking area next to the Appalachian Trail that will lead me by foot north into Hot Springs. The paved back road becomes an unpaved dirt path. I swear in my head I hear banjos from Deliverance playing. Then the brush clears and I see a tiny space to park my farm truck. I get my pack out and begin my hike. It’s quiet for the first mile then I hear someone else. I look behind me and see a tall person whose gender I can’t yet make out carrying a huge backpack. A few minutes later, I meet Sarah, a young women in her 20’s. Sarah is athletic, quiet and sweet. She has already hiked the El Camino de Santiago, a famous hiking trail in Spain. Sarah slows to my pace and we walk together until arriving at Deer Park Mountain Shelter. There she shows me one of the items inside her enormous pack. It’s a small guitar. I’ve heard of hikers carrying unlikely items in their backpacks and Sarah confirms this does sometimes occur. I leave Sarah happily filling her water bladder at a tiny stream when we part ways. Bladder is a new word I learn that refers to a bag like container that can be filled with water and later filtered for drinking. I actually have a 32 ounce one that came with my filter that is in my backpack. I just didn’t know it had a name. I move on to finish my section and check-in to our lodging before Mike arrives. He manages to join me in time for dinner. After dinner, we head back to the hostel while Mike is disappointed to learn there is no TV to watch the basketball game. But he is resourceful and finds a way to listen to it on his phone. After the game, he falls asleep while I think about tomorrow’s high mileage hike. In the morning, we pack up and head out. Unfortunately, the forecasted 45 degree cloudy weather is inaccurate. Today it is actually 24 degrees and snowing. 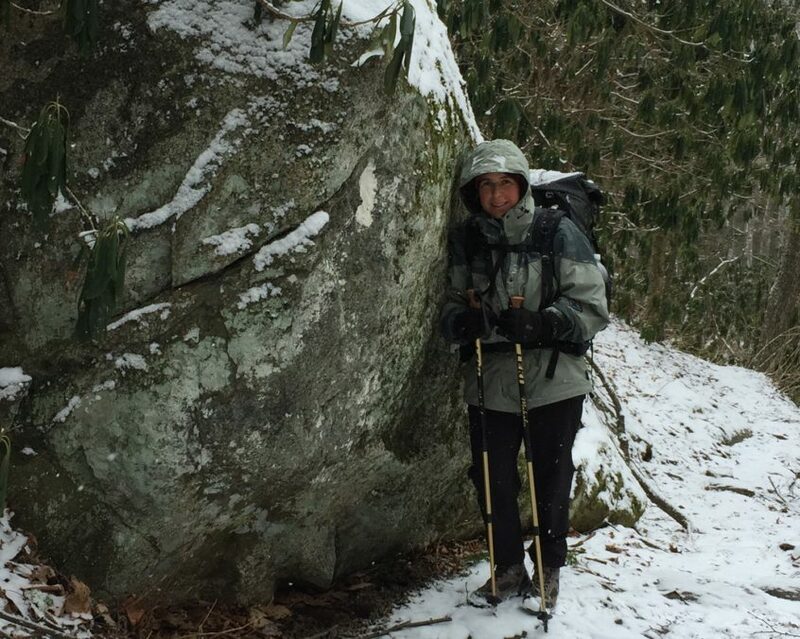 Apparently, many towns near the AT are at lower elevations and can have different weather than the higher elevations where you are actually hiking. Who knew? I had imagined a leisure pace with many breaks at scenic settings. I’d laugh right now if I wasn’t so cold. It sadly hurts our fingers and our core temperature to stop more than 5 minutes. Our only real break of the day is at Walnut Mountain Shelter to quickly eat a peanut butter sandwich which even frozen, tastes better than I expect it to. Mike pushes on and I try to complain as little as possible since I am the reason we were doing this hike. And surprisingly, after 7 plus hours at a very respectable pace for non-hikers, we arrive exhausted at our farm truck. Steam comes off my feet after I take off my boots and socks. I thank Mike for coming with me and tell him I can’t imagine I would have made it if I was by myself. As Mike drives us back to town to pick up our other vehicle, I start silently wondering if I am capable of doing this journey on my own. I guess there is only one way to find out.